The Lego Brickmaster series of books are a sort of cross between a book and a Lego set. Latest release in the series is Lego Ninjago Fight the Power of the Snakes, and publishers DK sent us a copy for review. 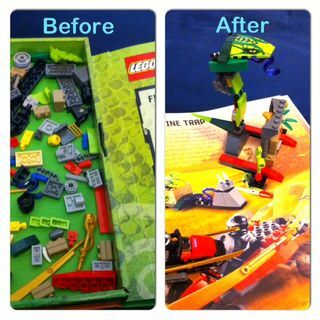 The front cover of the book forms a carry case for around 150 Lego pieces, with the right hand side as the book. This contains the instructions for how to make 12 models, fleshed out with facts and stories about the Lego Ninjago characters. As such it’s great for the reluctant reader who would rather be playing with Lego than reading a book, since it tricks them into doing both. The idea is that reading, building and playing happen naturally together, which is a really clever idea. My nine year old son, who’s a fairly keen reader, was less engaged by the book part as he said he would’ve preferred a story that flowed through rather than lots of facts. The book contains four missions, and he also found it slightly frustrating that you had to take each model apart to build the next one. 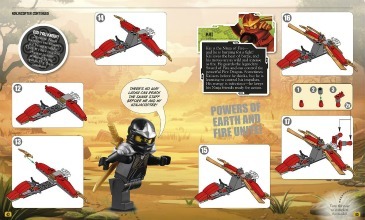 But I do think that any fan of the Lego Ninjago range would be thrilled to receive this as a gift. Possibly less so if they suffer from ophidiophobia – that’s fear of snakes, in case you were wondering. the Earth Ninja and Lasha the meanie snake dude. The box has been slightly re-designed from previous Brickmaster releases, making it easier to keep all the pieces together. All in all this is a nicely put together book and building set. But be warned – snakes are included. 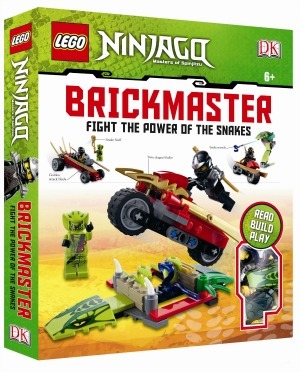 Lego Ninjago Fight the Power of Snakes Brickmaster book is out now, published by DK, RRP £18.99. Suitable for age six and over.